Makita HP330DZW 10.8v Li-ion Combi Drill White Bare Unit HP330. 10mm (3/8) Single-sleeve keyless chuck. 2-speed gear selection for controlled. Single LED job light with pre-glow function. Variable speed control by trigger. No load speed: 0-1,300 rpm 0-350 rpm. Blows per minute: 0-19,500 ipm 0-5,300 ipm. Torque settings: 18 + drill mode. The item "Makita HP330DZW 10.8v Li-ion Combi Drill White Body Only NO BATTERY HM" is in sale since Thursday, October 27, 2016. This item is in the category "Home, Furniture & DIY\DIY Tools & Workshop Equipment\Power Tools\Power Tool Sets". 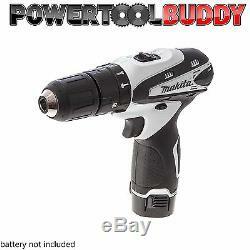 The seller is "powertoolbuddy" and is located in Newton Abbot.